*일 만회가 넘어가는 조회수에 광고악플이 수백건이 붙어 부득이 삭제하고 다시올림. 1888: October 25, birth at Winchester Va.
1908-12: United States Naval Academy. 1914: First flight in an airplane. 1916: Retired from active duty because of an injury to his foot that prevented sustained duty at sea. 1916-17: Naval aviation cadet at Pensacola, Florida. 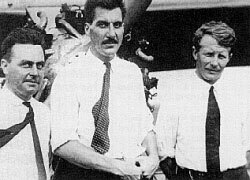 1925: August expedition to Greenland with Donald MacMillan, financed by Edsel Ford and John D. Rockefeller, with planes from Navy and Navy volunteers. 1926: May 9, flew the Fokker tri-motor plane Josephine Ford from Spitzbergen with pilot Floyd Bennett and claimed to have reached the North Pole. This expedition was privately financed and made up of volunteers. 1927: June 29, Trans-Atlantic Flight of America, a Fokker tri-motor commanded by Byrd reached France some thirty days after Charles Lindbergh. 1928-30: Byrd Antarctic Expedition, privately financed. 1929: With Bernt Balchen as the pilot, Byrd flies the Floyd Bennett, a Ford tri-motor airplane, across the South Pole. 1933-35: Second Byrd Antarctic Expedition, privately financed. 1934: March to August, Byrd stays alone in a hut some 120 miles from base to record weather and observe aurora. Rescued in August from carbon-monoxide poisoning. His autobiographical account of this ordeal, Alone, became a best seller. 1939-41: U.S. Antarctic Service expedition, led by Byrd but government financed. 1946: Operation Highjump to Antarctica, involving 13 ships and 4,000 men, mostly U.S. Navy, with Byrd as "Officer in Charge," but not in command. 1955: Operation Deep Freeze to Antarctica to provide logical preparations for the beginning of IGY 1957/58. Byrd was nominally in command. 1957: March 11, death of Admiral Richard E. Byrd. Here is a portrait of Admiral Byrd near the beginning of his rise to national attention. Born in October of 1888 to one of the most distinguished families in Virginia, Richard Byrd determined at an early age that he would pursue a military career and graduated first from the Virginia Military Institute and then from the naval academy at Annapolis. A football injury damaged his right foot and threatened to end any hope of sea duty. In 1926 Richard Byrd put his expertise in aviational navigation to work and challenged the public's imagination by being the first to fly over the North Pole. This photograph was taken moments before the first polar flights on May 9, 1926. Byrd himself was the navigator while Floyd Bennett was the pilot. 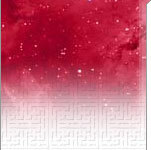 Your letter received and glad to hear from you. Thanks a lot for the compliment and clippings. The folks and friends at home must certainly appreciate them too. I don't think you know any of the other Washingtonians. Charlie Lofgren is on the "City of New York". A few sidelights on the recent trip to the "Barrier" might prove interesting. Our good friends in New Zealand were wagging their heads when we shoved off and many said we were slated for a "watery grave". In all fairness to them, we must admit that our ship looked anything but sea-worthy. Our cargo was perhaps the most general one ever shipped. It consisted of everything from toothpicks to (2) aeroplanes. 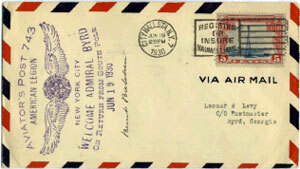 Byrd I: 1928-1930 Sent from Little America by J.J. "Teddy" Bayer, engineer on the S.S. CITY OF NEW YORK . Welcome Home! Aviator's Post 743 of the American Legion welcomes Admiral Byrd to New York City. Signed Bernt Balchen, chief aviator on the historic flight over the Pole in November 1928. This cover was prepared to commemorate the dedication of the Floyd Bennett Municipal Airport, by Byrd, on June 26, 1930. 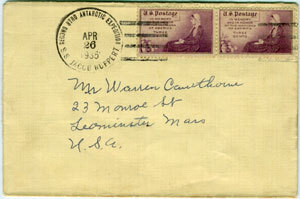 The cachet on the reverse of this cover is an imitation Byrd I cancellation, designed and used by prolific philatelic dealer A. C. Roessler. It is believed that Roessler intentionally made a slight adjustment to the cachet (leaving out the lower right meridian line) in order to support his claim that this was not a forgery. 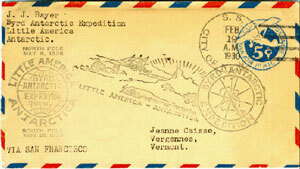 This example is from a set of 17 postcards issued for the expedition. On the reverse are various photos from the prior Byrd I Expedition. Captain English personally signed a possible 15,000 cards and most likely saw to the cancelation of many at the "branch" Little America II post office aboard the BEAR. Due to her slower speed, the BEAR OF OAKLAND, under the command of Lieutenant (J.G.) Robert A. English, U.S.N. left Boston harbor on September 25th, 1933, nearly two-and-a-half weeks earlier than the JACOB RUPPERT. While en route to the Panama Canal a hurricane was encountered, nearly sinking the ship off Southport, North Carolina. She met a full gale off Diamond Shoals lightship and was warned by radio that the strongest part of the storm lay dead ahead. Lt. English tried to make a run for Southport Harbor but by October 4th the seas were breaking over her decks and she was taking on vast amounts of water, faster than the pumps could handle it. It was a terrible night as bucket lines were formed and the crew, scientists and veterans steadied themselves on slippery decks and ladders, passing three-gallon buckets of bilge water to the main deck and lowering empty buckets to the men below. The sea rose to the level of the boilers . . . it was serious indeed. After hours of battling, she finally made it to shore and anchored off the entrance to the harbor. Due to the extreme punishment she took, it was necessary to return to Newport News for dry-docking. Repairs were made and she set out for Antarctica, this time successfully, on November 1, 1933. 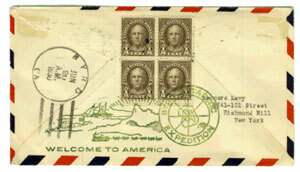 Cover addressed by the expedition Ornothologist and sent to the National Zoological Park in Washington, D.C.
Philatelically, the most significant port-of-call enroute to Antarctica was made by the USS NORTH STAR at Pitcairn Island. The resultant Richard Black originated covers, officially sanctioned by Byrd (who personally approved the commemorative cachet), are among the most prized philatelic items for the U.S.A.S.E. The vessel paid a visit to Pitcairn Island on December 13-14, 1939. The Pitcairn post office was quickly sold out of New Zealand stamps, but through special arrangements, unstamped covers reached their destinations as well as those which were franked. 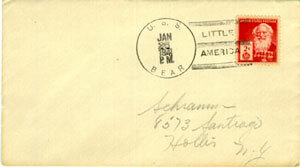 The cachet was designed by Richard Black, leader of East Base, and was applied to mail during the visit. According to news articles of the day, approximately 790 covers were serviced. Two types of mail from this stop exist -- mail left at Pitcairn for a stateside destination and mail canceled at Pitcairn and taken along for the journey south. Admiral Byrd was to remain active in Antarctic exploration and scientific investigation until his death in 1957. Shown here, Admiral Byrd is in his office prior to Operation Deep Freeze in 1955, when he made his last trip to Antarctica. Its objectives were to establish bases for the scientific work of the International Geophysical Year of 1957-58, which was dedicated to research in Antarctica. It is not possible to know the history of the polar regions or undertake scientific investigation of the areas without being aware of Admiral Richard E. Byrd or benefitting from his contributions. As a navigational aviator, Byrd pioneered in the technology that would be the foundation for modern polar exploration and investigation. As a decorated and much celebrated hero, Byrd drew popular attention to areas of the world that would become focal points of scientific investigation in numerous disciplines. Finally, as a naval officer Admiral Byrd contributed to the role of government in sponsoring and facilitating research in polar regions and topics. Richard E. Byrd first made his mark in the U.S. Navy. Graduating with the class of 1912 from the U.S. Naval Academy, he served in the battleship fleet until forced into medical retirement in 1916 from the after-effects of a smashed ankle suffered while a midshipman. Recalled to active duty in a retired status, he organized the Commission on Training Camps. In April 1918 he won his wings as Naval Aviator 608. From the start of his flying career he demonstrated unusual ability. Byrd pioneered the technique of night-time landings of seaplanes on the ocean and flew out over the horizon, out of sight of land, and navigated back to his base. In 1918 he proposed flying the newly built NC-1 flying boats across the Atlantic to the war zone in France. His war service was in Canada as Commander, U.S. Naval Air Forces with responsibility for two air bases in Nova Scotia. With the conclusion of hostilities, Byrd was called to Washington and made responsible for the navigational preparations for the transatlantic flight attempt of the NC flying boats in l9l9. He was a skilled officer in representing Navy interests under consideration by the Congress. Byrd won wide acclaim for directing the lobbying effort that resulted in the first post-war pay-raise for military personnel. Byrd was also invaluable in the long campaign of Naval aviators to establish a Bureau of Aeronautics. Interested in polar exploration from childhood, his adult involvement began in 1924 when he was appointed navigator for the proposed transpolar flight of the Navy's dirigible Shenandoah from Alaska to Spitzbergen. When the flight was canceled by President Coolidge, Byrd began to organize his own Navy flight expedition to the Arctic. He was compelled to join forces with the MacMillan Expedition to northwest Greenland sponsored by the National Geographic Society in 1925. At that time Byrd completed the first flights over Ellsmere Island and the interior of Greenland. In 1926 he took leave from the Navy to organize a privately financed expedition to the Arctic, which was to be based in Spitzbergen. Plans included several flights over the pack ice, including one to the North Pole. Supported by Edsel Ford, John D. Rockefeller, Jr., the New York Times and others, Byrd and his pilot, Floyd Bennett, claimed to have reached the North Pole on May 9, 1926. Both men were awarded the Medal of Honor after their return to the United States. In later years scholars have raised questions about the success of the expedition in flying over the North Pole. Cheered by the outpouring of public support and admiration, Byrd continued his leave from the Navy. With commercial sponsorship, he completed the first multi-engine airplane crossing of the Atlantic to France. 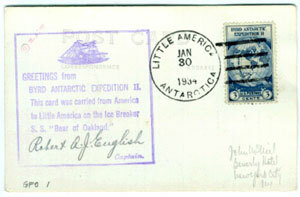 Byrd then turned his sights to Antarctica in 1928. During the remaining years of his life he was involved in five expeditions to Antarctica. These explorations accounted for the discovery of hundreds of thousands of square miles of territory which were claimed for the United States. He personified the inception of the mechanical era of Antarctic exploration. No other person in Antarctic history has contributed more to the geographic discovery of the continent than Byrd. With highly visible accomplishments, he thrilled millions and raised large amounts of funding. He flew over the South Pole in November 1929. He spent most of the winter of 1934 alone in a meteorological hut some 100 miles into the interior. His winter weather observations were the first taken from the interior. This effort almost cost Byrd his life when he was poisoned by carbon monoxide fumes. 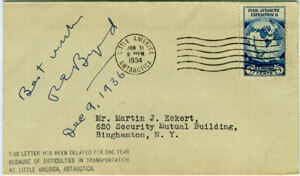 Byrd remained a promoter of Antarctic exploration. He merged his plans for a third private expedition with governmental plans and became the commanding officer of the United States Antarctic Service. With the onset of World War II he returned to active service and earned two decorations as the Chief of Naval Operations. In the early post-war years, Byrd participated in the organization of the U.S. Navy Antarctic Developments Project in 1946-47 (Operation Highjump) He supervised the preparation of a study for the Joint Chiefs of Staff of Greenland as a site for military training and operations. In his final years he was called again to serve the nation as Officer in Charge of United States Antarctic Programs. This responsibility gave him authority to coordinate government supported scientific, logistic and political work in Antarctica. Admiral Byrd remained an influential figure in polar research until his death in 1957. The Ohio State University served as a data collecting center for polar regions in the IGY 1957/58 (International Geophysical Year). In 1960, the Institute of Polar Studies was established to bring together scientists from a variety of subject disciplines who were engaged in polar research. The first director of the Institute was Richard Goldthwait. Dr. Goldthwait had originally joined the university faculty in 1946 and remained as director until 1965, when he became chair of Geology. The library of the Byrd Polar Research Center bears his name. Other directors have been: Dr. Colin Bull (1965-69), Dr. Emanuel Rudolph (1969-73), Dr. David Elliott (1973-1989), and Dr. Kenneth Jezek (1989-1999), Dr. W. Berry Lyons (1999-present). In 1985 the Institute of Polar Studies acquired the first set of papers of Admiral Richard E. Byrd. The negotiations also led to an endowment to fund a research scientist in honor of the polar explorer. In addition, the Institute changed its name to the "Byrd Polar Research Center" in 1987.
and Richard Cullather of the Byrd Polar Research Center. 피어리는 37일 만에 북극점에 도달했다. 아문센은 남극점을 주파하는 데 99일이 걸렸다. 하지만 리처드 버드는 두 극지를 하루도 채 안 되는 시간에 통과했다. 비행기를 타고 날아서 극점을 탐험했기 때문이다. 그렇다고 비행기를 이용한 탐험이 쉬웠던 것은 아니다. 1920년대 원시적 비행기로는 거센 눈보라와 혹한을 뚫고 멀리 날아간다는 건 목숨을 건 위험한 일이었다. 버드는 1888년 미국 버지니아 주에서 태어난 군인 탐험가였다. 해군사관학교와 해군항공학교를 나온 그는 1918년부터 해군 장교로 복무했다. 해군항공학교에서 배운 조종술이 그의 인생항로를 결정지었다. 1926년 북극 비행에 나선 버드는 그해 5월 포커 3발 비행기를 타고 북극점 왕복 비행에 성공했다. 비행시간은 15시간 23분, 최초의 북극점 비행이었다. 이듬해 뉴욕에서 파리까지 대서양 횡단 비행에 성공한 버드는 1929년 다시 남극점 비행에 도전했다. 11월 28일 웨일즈만을 출발한 비행기는 10시간 만에 남극점에 도달했고, 18시간 30분 만에 무사히 회항했다. 역시 최초 기록이었다.